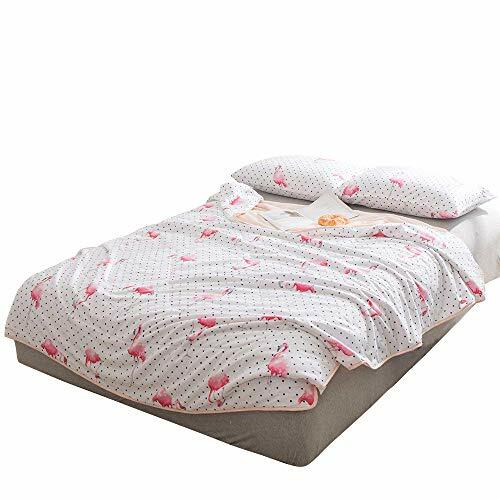 Enjoylife 1-Piece Soft Thin Quilt Washable Full Cotton Summer Comforter Animal Printing Pattern Flamingo-1 BEDSPREADS&Blanket 200x230cm = 79"x90"
2. Simple Printing Patterns cotton quilt, Style classique and simple, which will offers you a quietness and warm feeling at home. Close to nature and enjoy nature, excellent Gift for your family kids or your friends, warm love for them. 1) Pillowcase NOT Included, only 1 piece! 2) EASY CARE-----Machine wash on cold, tumble dry on low, and low rion when needed. Enjoylife is a high-Quality store in Home Textile, we mainly produce and sell duvet cover set, made from 100% Cotton, Long-staple cotton, Pure Flax/linen, Puma Cotton, or other better materials. In addition, we also sell thin comforter, FITTED SHEET, and children playmat which is good-Quality. Also Noted, We have never authorized any other sellers to sell our products and will pursue legal action to sellers who sell our items on Amazon! Shipping NOTE: usually DHL/UPS/Fedex EXPRESS. But still please pay attention to lead time on Amazon, if you are in a hurry, please choose "Expedited Shipping" service.